In my previous blog we saw the Full-Text Index architecture. In this blog we shall see its implementation. Before you proceed you need to ensure that this feature is added to your instance and the full-text services are running. Unlike Standard indexes we aren’t giving it any name. As SQL server allows only one Full-Text index per table the naming is taken care by SQL server. The Key Index clause specifies the unique non-null column which is mandatory when create full-text indexes. 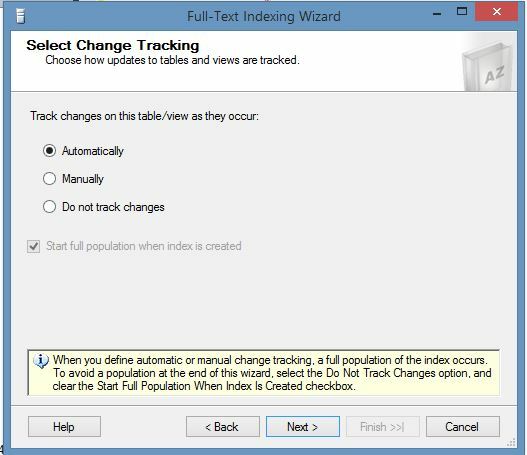 In the previous blog I’ve mentioned how population of the index depends on the type of Change_Tracking option selected. 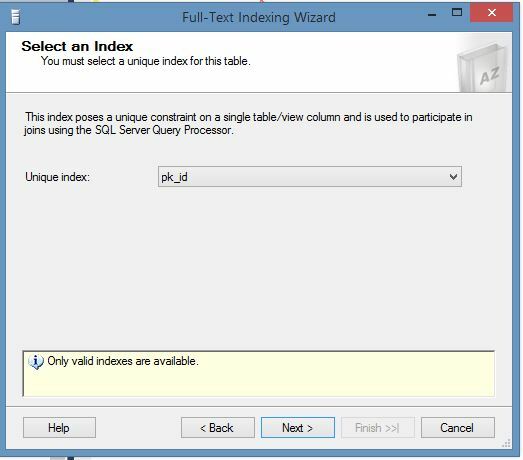 When Auto is selected the changes are automatically tracked and updated by SQL server for the full-text indexed columns. 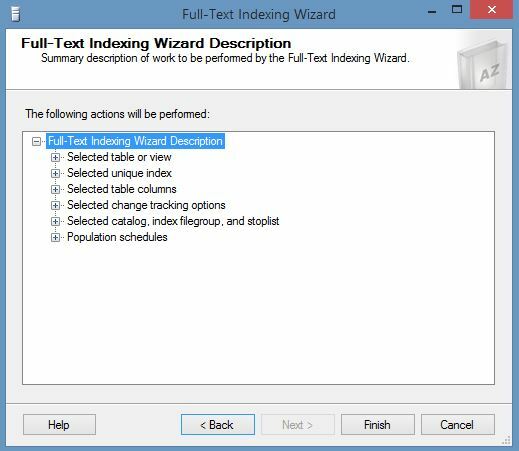 When Manual is select the changes are tracked but the indexes aren’t updated unless the ALTER FULLTEXT INDEX … START UPDATE POPULATION is fired. This may be called through a SQL agent job as well. There is one more option which is not commonly used. It’s the Change_Tracking Off option when the changes are not tracked at all by SQL server. 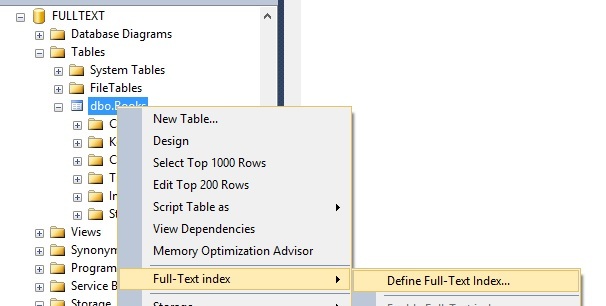 It’s available when creating full-text indexes in static tables. Here im creating my own StopList. This option is available under Database-> Storage -> Full Text StopList. I shall be building it from the system stop list and adding the word “describes” to StopList. The Contains Predicate will search for the exact words or phrases that I pass. It also searches for proximity words & inflecting forms of the word. If you want more matches in terms of meaning of the words and not just the exact words we use the FreeText Predicate. It also allows for pattern matching with wildcards. I could go on for providing further examples but these are very well described in the below links. Highly recommend that you go through these examples prior to implementing it in queries. SQL server has the capability to store text-based data in the form of char, varchar, nchar, nvarchar, text, ntext, image, xml, or varbinary(max). When querying the data stored in such columns the “LIKE” clause would be highly used for pattern matching. It will work fine doing a table scans for the pattern match. However consider if this was a library management system consisting of millions of records. In such a scenario performing a table scan over a table is not a wise option. 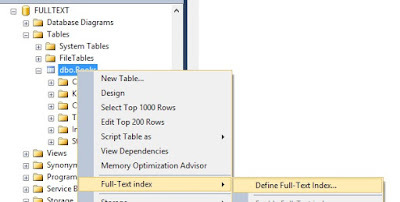 For such situations SQL server provides a functionality called full-text search. SQL Server's full-text search engine gives you fast queries and advanced pattern matching in an enterprise environment. It works against text data in full-text indexes by operating on words and phrases based on rules of a particular language such as English. To understand its architecture and how it works we need to familiar ourselves with its terminologies. It’s a logical container for Full-Text indexes. 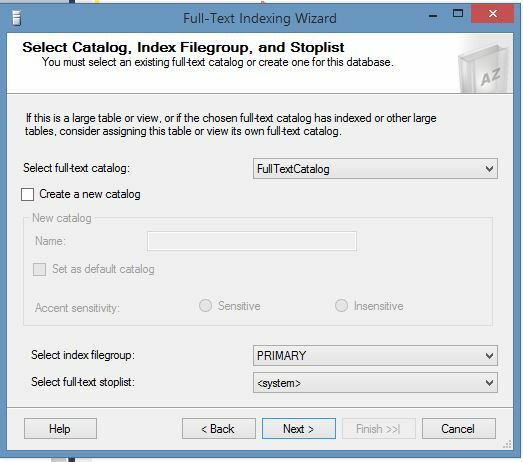 A database can have one or more full-text catalogs. The indexes are aggregated as a collection in terms of catalog purely for administration and maintenance purpose. It is used to set common property values for all the indexes it stores. For any language like English we have certain words which are considered as base or root words. From these new-words or its conjugates can be formed. Consider the word “Eat” from this we can derive words like “eating, will eat, shall eat, ate, etc” these are its derived forms. Such words are called stemmers. Identifying the word stemmers comes in handy for pattern searching while using full-text indexes. Any characters which delimit sentences or phrases for the language are called word breakers (Spaces Excluded). They are particular for each supported language in SQL server. Once identified further action can be taken in building the FTS index or processing the query. Every language has certain words like conjunctions, pro-nouns which provide no meaningful benefit when used in search criteria’s. For example words like “the, are, and, to,etc” are commonly discarded for full-text indexes. These words are called stopwords. By excluding these words the Full-Text indexes become more efficient. The indexes however do take into account the position of such words when encountered. 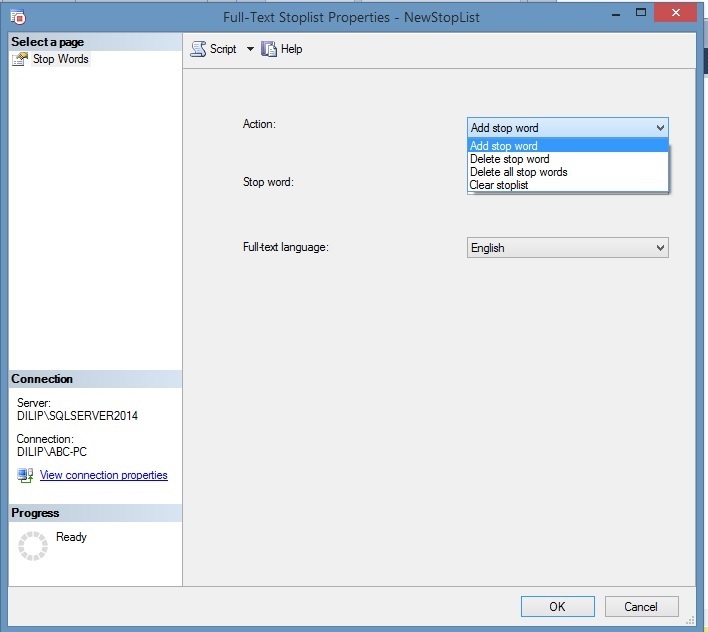 As the name suggests StopList is a list of Stop words. 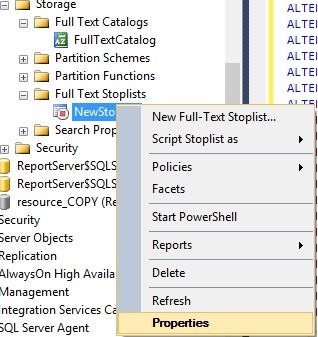 SQL server lets you create & customize your own StopLists. A) Full Population - As the name suggests builds full-text indexes for all the rows of the table. Similar to that of a standard index rebuild operation. 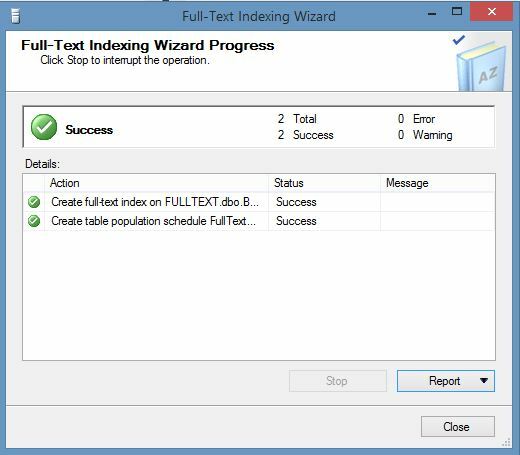 The default behavior of SQL server is to populate a new full-text index fully as soon as it is created. 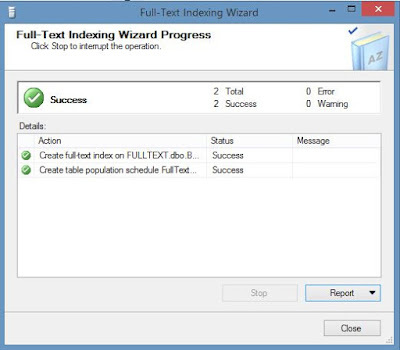 B) Change Tracking-Based Population /Update Population This uses change tracking functionality of SQL server. 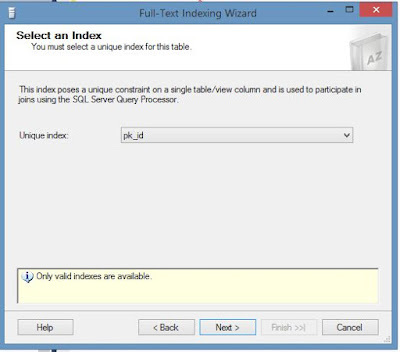 SQL server maintains a table which tracks modifications made to the index after its initial full population. Based on CHANGE_TRACKING property of the index whether set to AUTO or MANUAL the indexes are populated.Default behavior is Automatic Change_Tracking. 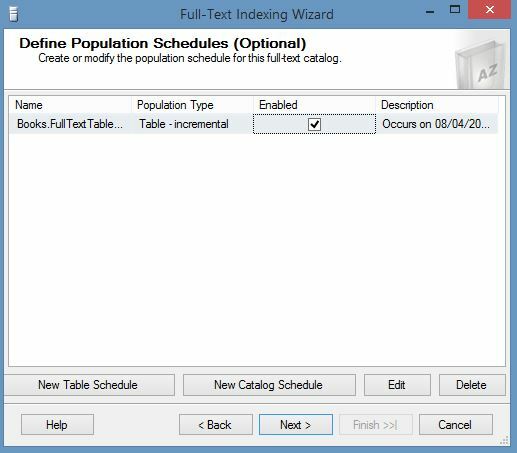 C) Incremental Timestamp-Based Population - This requires that the indexed table has a column of timestamp data type. If such a column does not exists SQL server will treat it as a full population operation. If the column exists SQL Server will update the modified rows based on the value of the time-stamped column. Thesaurus comprises of synonyms or word expansions for any given word. Each language has its own set of defined synonyms. This is an XML file stored in file system. This broadens our search criteria to find similar words at querying time. 3) The Full-Text searches are sent to Full-Text Engine during both the stage Compilation and Execution. 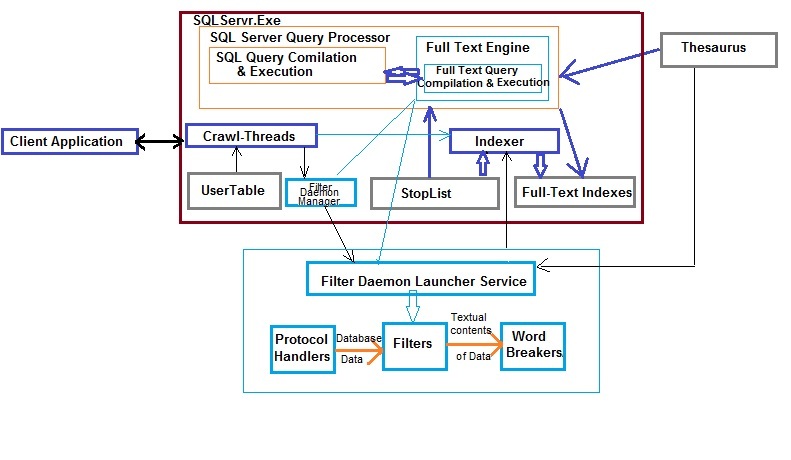 SQL Server Query Processor is responsible for parsing, binding, optimization and execution.The Full-Text Engine receives the Full-Text part of the queries from the query processor. 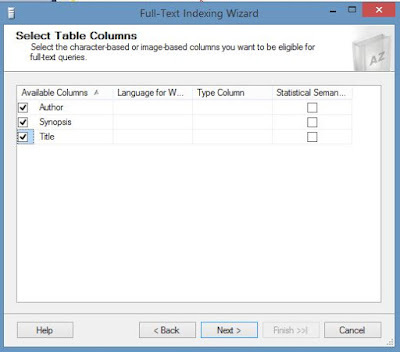 It works in conjunction with the SQL server query processor. 4) In order to full the requests a Full-Text engine calls for the Indexer. 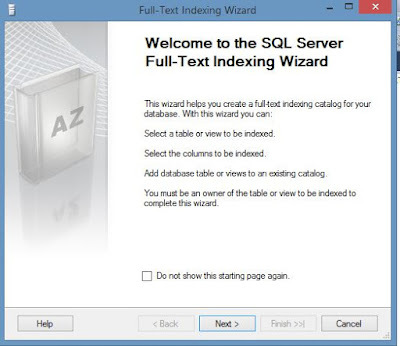 The indexer is responsible for evaluating the StopList and populating Full-Text Indexes which form a part of the database from SQL server 2008 onwards. Prior to this they were stored separately on file systems. 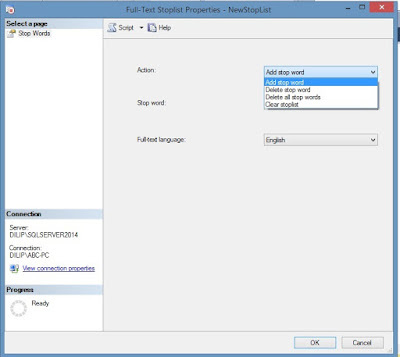 StopList will also contain stopwords which are ignored during query evaluation. 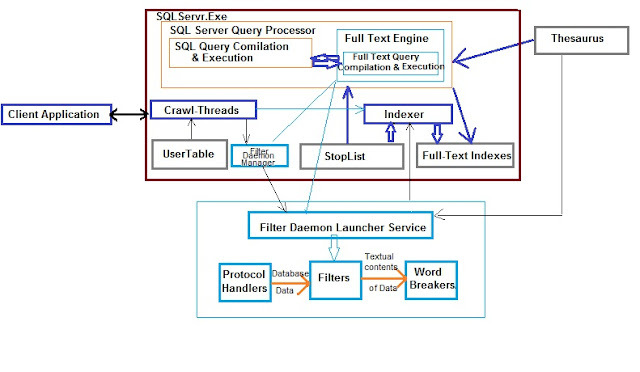 6) Filter Daemon Manager is responsible for monitoring the Filer Daemon Launcher Service or Host Service.Its external to the SQL Server Engine.Inside SQL server engine the user tables are evaluated during full-text index population or crawl process by the indexer. This data is also used by the Filter Daemon Manager process which passes this information to the Host Service. a) The protocol handler which is responsible for pulling SQL server data from memory and passing the database data to the filter. b) The filter extracts chunks of data from the input provided by protocol handler. This is dependent on the document type. The embedded formatting is removed by the filter retaining only the textual contents and their position information. This result-set is then passed to the work-breakers. 9) During the querying process the Full-Text Engine uses the full-text indexes generated by the indexer. The word-breakers and thesaurus are first referenced to generate all forms of query predicate. The query processor then looks-up for all these forms in the full-text indexes. The Full-Text Engine is also responsible for the optimization process much like a standard query optimization process to retrieve the data. 10) The SQL query execution results and Full-Text query execution results are combined and the final result-set is sent across the client. 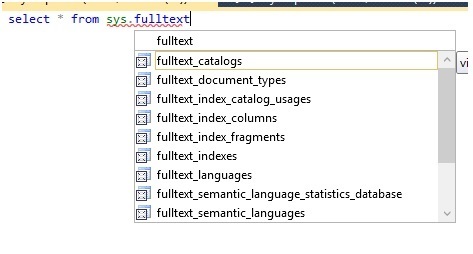 In the next blog we shall see how to create Full-Text Catalogs,Indexes and how to use full-text index queries.